In a little over a century , the Ancient Egyptians built the masonry pyramids , witch contained more than twenty five (25) million tones of limestone blocks . These an -made mountains appear to modern eyes to be useless , but they must have been considered useful by the Egyptian . 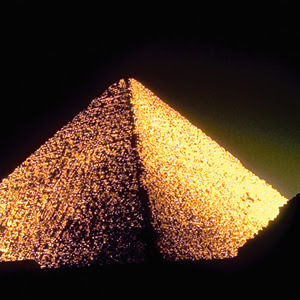 Humankind has confused and clouded the history of Egypt and the pyramids with misrepresentations and distortions . Form a distance , what we have learned about the pyramids may appear factual , but once we get closer to examine it , it proves to be an illusion . While most references about the Pyramids are shallow and repetitive , there a few books with focus on discovering the truth . These were authored by brave writers who published their findings, regardless of the popularity and acceptance , Among these few who had the courage , is Dr. Joseph Davidovits .His research shed light and substantial evidence , to some of nagging questions regarding the construction of the Pyramids .
" No body likes being proved wrong , but in the case of the scholar or scientist , a sound theory that contradicts views held and pursued for a life pulls the rug out from under his or her ego , and a familiar paradoxical situation develops . The people professionally engaged in discovering the " Truth ' are those psychologically least capable f accepting the "Truth " if it happens o contradict what they already believe "
Start to discover the Ancient Egyptian Pyramids with our blog ancient Egypt with open mind . Where the Egyptian pyramids tombs ? The answer is a resounding No . There is however , an unusual situation the case of Zoser's Pyramid at Saqqra . As we will find later in Saqqara, Zoser built complete underground burial chambers , for himself and his family . Building a step pyramid was afterthought , witch came a few years later . The Burial chambers are not an integral part f he pyramid structure . The nine remaining pyramids , witch have been constructed from solid core masonry , are not tombs . Where did Egyptians bury their Kings at that time ? During the Early Dynasty Period , the tombs of the kings and nobles consisted of subterranean burial chambers with large , Low , rectangular , Mud -Brick superstructures . These types of tombs were called mastabas , meaning benches . The subterranean parts contained the burial chambers , witch were surrounding by many other other chambers and stone rooms , for he less important funerary goods . The burial chamber was a narrow chamber hewn out of the rock , to which a shaft leads down from the roof of the mastaba . The Superstructures were rectangular , low in proportion to its length , and with a convex roof . They varied in size from 24 square yards ( 20 square meters ) to an area of more than 1/4 acre . How did they bury their kings at that time ? The kings were buried in simple rectangular wooden chests , covered with funerary texts and inscriptions . The wooden coffin was placed inside a stone sarcophagus m which was also covered with funerary text and inscriptions . The viscera ( stomach , intestines , lungs m and liver ) of the deceased , were placed in four individual containers , called canopic jars , next to the sarcophagus . How did the pyramids var from the normal royal tombs of that time ? 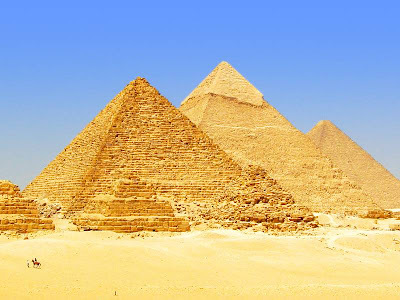 What the different between the Egyptian Pyramids and Egyptian Tombs ? These nine pyramids are totally void of any official inscriptions , offering rooms ,and other funerary features , found in bother earlier and later tombs . There are too few empty "stone chests " and too many empty rooms in these nine pyramids , to theorize that were tombs . If we accept , hypothetically , that robbers might have smashed the stone chests and their lids , on can hardly accept the logic that these robbers would have taken the trouble to steal the smashed stone chests. In spite of careful search , no chips of broken stone chests or their lids were found anywhere in the pyramids passages ans charmers . The passageways in the nine pyramids are too narrow to provide for the manipulation of the stone chests . 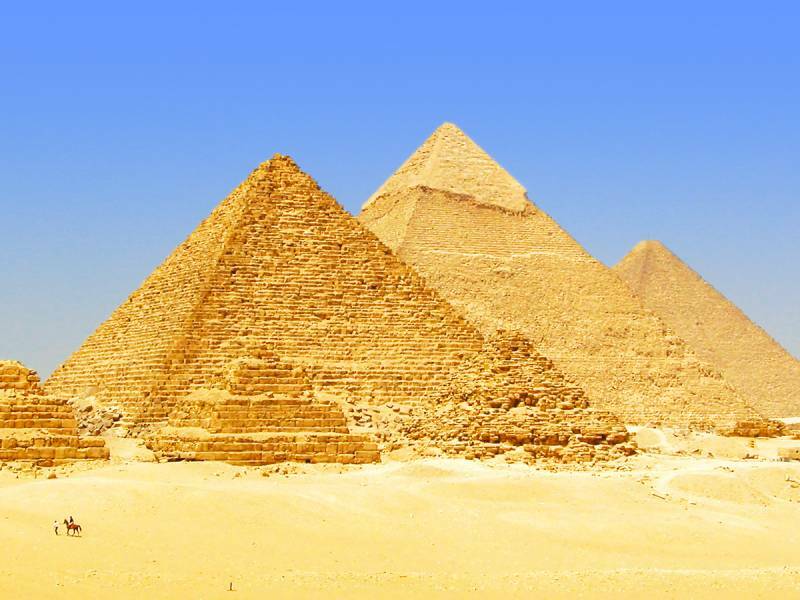 These nine Pyramids are distinctively lacking adequate space arrangements . One pharaoh , Snefru might have built two and possibly three pyramids , and nobody expects him to be buried in all three of hem . No human remains were found inside the nine masonry pyramids . Thieves steal treasures , but they would naturally avoid dead bodies . As you review the sires and interiors of these pyramids you will discover the overwhelming evidence that the pyramids were not built to entomb anybody .